At Food of the Gods we are proud to offer our service for International Delivery Gift Hamper Food and Wine. We have over 20 years of experience sending our unrivalled range of gift hamper food and wine across the world including UK, Europe, USA, Canada, Australia, New Zealand, South Africa, Middle East, Asia and the Far East including China, Japan, India, Singapore, Malaysia, South America and major countries worldwide. TNT European Road Service and International Express Air Services to send food and wine gifts and hampers across the world. Our prices are highly competitive and charges vary from country to country and are determined by item weight and delivery service selected. 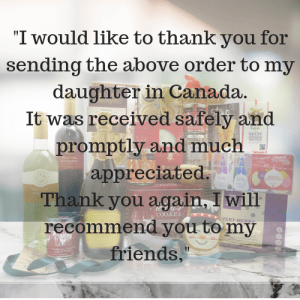 For international delivery rates please select the destination country for delivery to in the drop down menu after adding your food and wine gift or hamper to the cart to calculate the delivery rate for your gift. You can repeat the procedure as many times as required for different items, before you decide to progress with your order. Restrictions on goods may apply in certain countries and custom duties may be payable on certain gifts by the overseas recipient. We are not able to advise on the exact amounts, but we may be able to provide you with some information as a guideline only. We also offer a duty paid service on request so that the recipient of the gift or hamper does not have to pay. 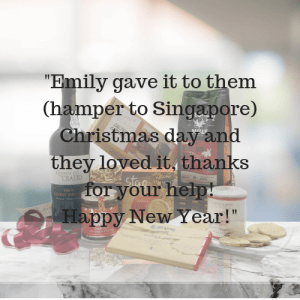 If you require assistance and further information on sending a food and wine gifts and hampers for international delivery, please call us with your destination address and we will be pleased to help you.